Asst. Chief - Charles Cahill, Jr. 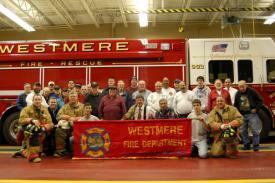 The Westmere Fire Department is part of the Westmere Fire District. The Westmere Fire District is a governmental entity formed under the laws of the State of New York. It is governed by a board of five commissioners, each of whom serves a five year term. One commissioner is elected every year.